Bioreactor characterization, Thermo Scientific™ TruBio™ DeltaV™ controller optimization, online process analytics, and scalability analysis of the S.U.B. 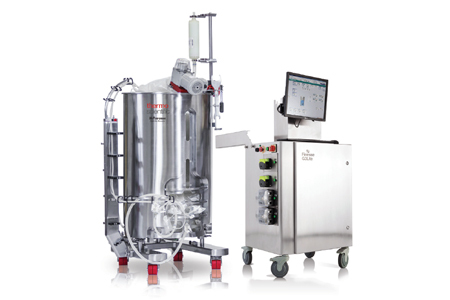 when targeting perfusion applications in working volumes for pilot scale (50 L) to production scale (500 L). High-density culture results (>260 x 106 cells/mL) while maintaining proper operating parameters. New data reveal how a 50 L S.U.B. equipped with a specialized precision drilled-hole sparger (DHS), single-use foam probe, and oversized impeller is able to improve overall S.U.B. operating efficiency. Results also include specific suggestions on how to maintain a nearly ideal dissolved carbon dioxide environment, reduce generation of foam in the eadspace, and produce lower overall shear levels, thus yielding excellent cell viability.